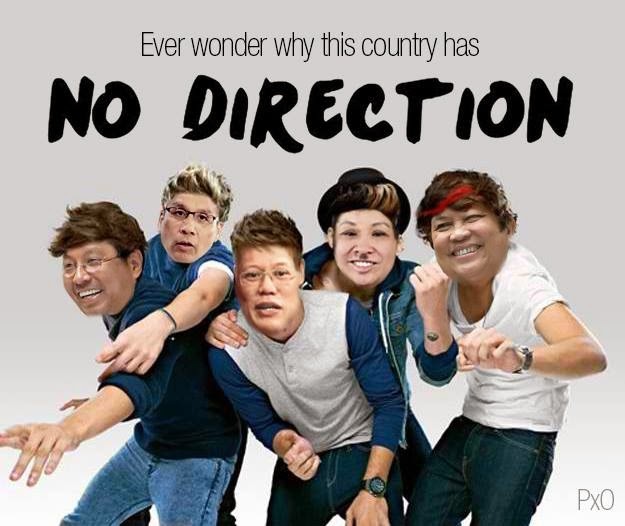 Satirical News: President Nobita Forms Music Band Called "No Direction"
After the rather butthurt incident of the long line at the SM Mall of Asia to get the VIP ticket for One Direction, someone should realize by now that President Nobita (center) just formed a music band called "No Direction". Members are Butcher Abad, Mar Roxas, Kill Henares and Money Villar. Money Villar ran against President Nobita during the 2010 elections but lost. However he joined the band as well to gain popularity. President Nobita said, "Well it's too bad the Filipino youth don't listen to OPM anymore. You don't see them line up like that for OPM concerts. So sad that's why as President, I am now forming my band called 'No Direction' to counter One Direction's overly popular side. But they can still do their concert here but Filipinos still need some OPM." The music band itself is expected to debut during the next SONA. As of right now, ABias-CBN will be their official recording studio. VIP tickets will be sold soon at the SM Mall of Asia for a whopping PHP 170,000 for VIP passes. "I am anticipating this will be the greatest moment in history. We will make the SONA more lively than it was four years ago." said President Nobita.